I have been seeing a lot of recipes for Persimmons lately. A little confession here. I never heard of them, seen them or tried them until now. I am fortunate to live in an area that has an abundance of local farms and co-ops. I subscribe to a service that delivers a fresh box of locally grown organic goodies once a week. Guess what was in the box this last week? Yep, you got it. Persimmons. What were these ugly little specimens? I scrutinized them closely and concluded they must be in the tomato family so I took them out of the box and put them in a bowl with my tomatoes. When I finished unloading the rest of the produce, I scanned the label to see what was on the list and found out they were called persimmons. I had just read a delicious recipe for making Persimmon Pancakes with Maple Syrup and Persimmon Sauce on one of my favorite blogs by FoodBlogAndTheDog. Ah ha! That’s what I would make. However, my new little persimmons were quite hard so I thought I would just leave them on the counter (with the tomatoes) to ripen. A few days later I gave them a soft squeeze and found they were just as hard as the day I got them. Did I get bad ones? I posted a question on my FaceBook page and quickly found a few friends who gave me an persimmon education. There several types, one of which are hard like an apple that you eat raw and the other that ripen to a soft tomato consistency. (See! I knew they were related to tomatoes somehow!) The soft oblong ones you can puree and use in the recipe I am still waiting to try. The short squatty ones you eat raw like an apple. I immediately had to try one. I cut a piece off and had my first taste of persimmon heaven. They really are delicious! I had just made a spicy Ethiopian Chickpea Stew that needed a simple dessert. I immediately knew these little babies would be the perfect compliment. 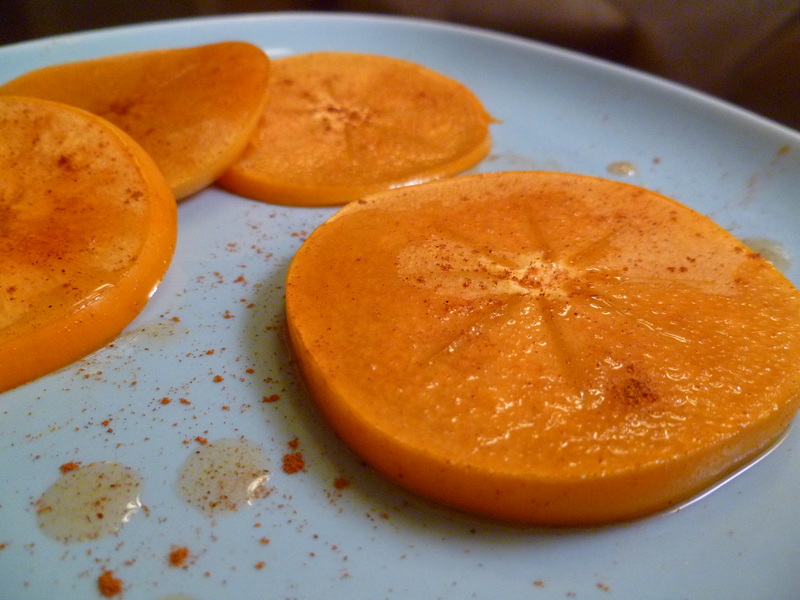 Honestly, after a spicy dish, persimmons would be great sliced and eaten raw. But since it seemed just a little TOO easy, I sliced them up, laid them out in a baking dish, sprinkled a little cinnamon, drizzled a little pure maple syrup and popped them in the oven to bake for 15 minutes (covered). It tasted like fruit pie. Yum! If you haven’t tried these wonderful little fruits I would highly recommend you do. 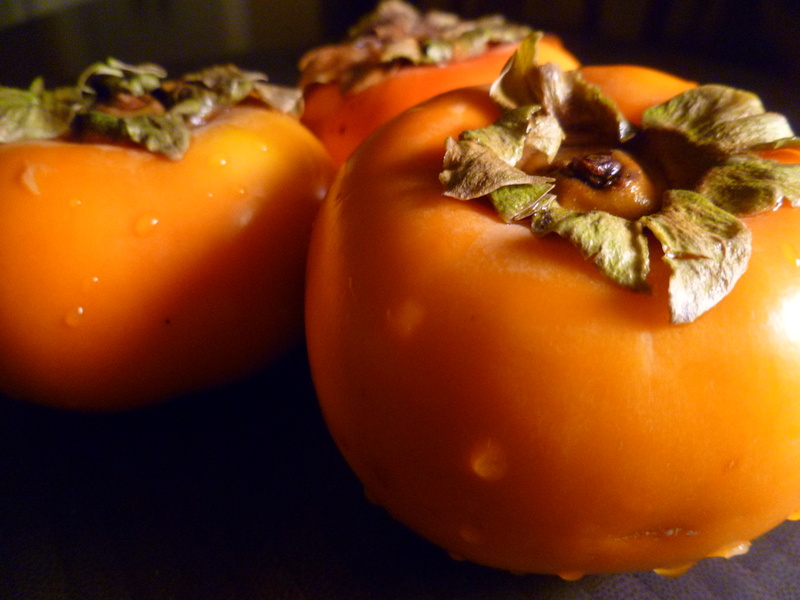 And of course, if you have any persimmon recipes to share, I’d love to hear! I just got my very first persimmons this past week at the farmer’s market. They are still ripening but I can’t wait to try them! Persimmons are amazing, a great healthy snack. They are not related to tomatoes though, They grow on trees, not bushes or vines. I guess I’m fortunate because I have trees in my backyard and in my grandparents backyard. There’s lots of recipes for them, they make a wonderful sponge-like cake if you mix the pulp of the squishy ones in with just a plain white or yellow cake batter. If mixing them into cake batters, and other baked goods a little extra baking powder and a little extra flour helps to keep the cake together! I have had my fair share of floppy persimmon cakes due to not enough flour lol. 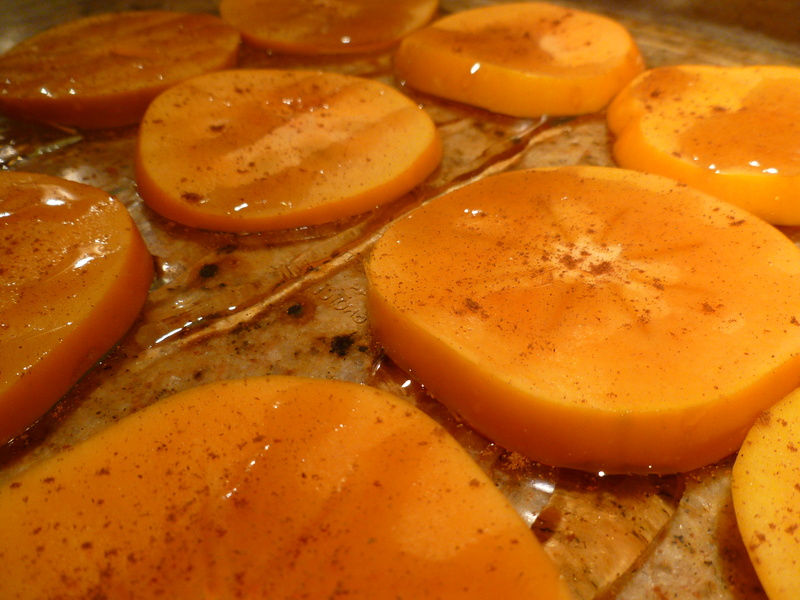 There are some great recipes for persimmon pudding as well. It is delicious served hot. I will have to see if I can’t find some of the recipes my grandmother uses. I have never had any of the hard ones, just the soft, also if you ever find a tree, do not, I repeat DO NOT eat the ones off of the tree, Unripe persimmons are the most bitter tasting things I have ever tasted! My mom always said don’t believe everything you read-LOL! I can swear I got that from a reliable source but now that I look again, you are absolutely right. Persimmons are definitely NOT related to tomatoes, although it appears they often get confused with tomatoes because they look a bit like them. Thanks for the great info on persimmons!